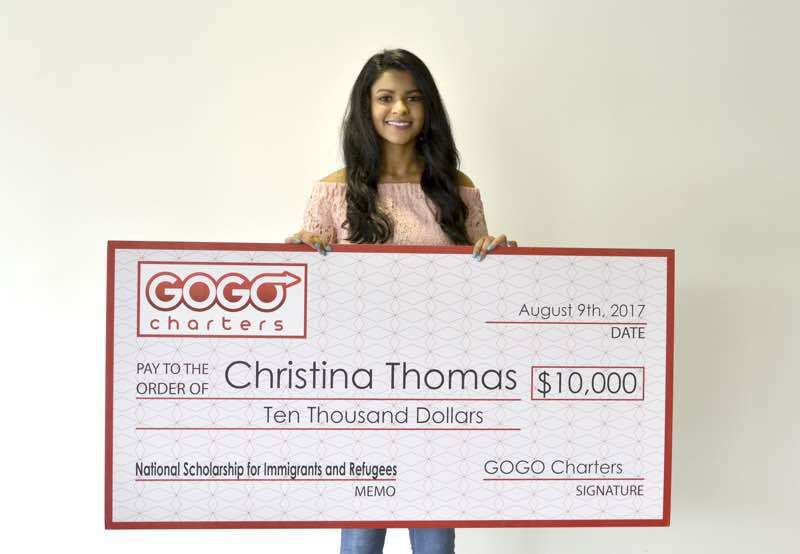 Inspired by our CEO’s challenges as an immigrant himself, the National Scholarship for Immigrants and Refugees provides $10,000 to one student who has faced similar challenges and exhibits the same ambition that has grown GOGO Charters to what it is today. Armir Harris, founder of GOGO Charters, began his life in the United States as a teenager after fleeing his home country of Albania as a political refugee. Under the wing of his uncle, who owned a limousine and party-bus service, Harris learned the ins and outs of the bus reservation process, noting how outdated much of the process was in comparison to other industries. His experiences working with his uncle inspired him to create a new reservation platform that would streamline the booking process and provide price quotes within minutes. With only $800 in his pocket, Harris worked tirelessly to grow Shofur, the parent company of GOGO Charters, into the multi-million dollar, nationwide business it is today. Now, Christina Thomas, a young woman exhibiting the same drive and ambition that built Shofur, has been awarded $10,000 to help aid her studies as she pursues a degree in genetics. At 18 years old, Thomas has already completed an internship at Wellstar Kennestone Hospital in Marietta, Georgia, served as co-president of Kennesaw Mountain’s “Future Healthcare Providers” organization, and graduated with a 4.0 GPA. Thomas’s hard work and dedication set her apart from over 500 scholarship applicants from all over the USA. Thomas is now a freshman at the University of Georgia, where she is pursuing a degree in genetics and is on track for a career in neonatology. We at GOGO Charters are extremely proud of her work thus far, and we can’t wait to see what the future holds for this outstanding student! Click the “play” arrow below to listen to the moment Christina found out that she had won the scholarship, plus some advice from our team about college life in Athens. Congratulations Christina, and GO DAWGS!